This week, we’re finalizing the items we’ll need to set the table for Thanksgiving. And besides the most important turkey of them all, we’ve included a few extras to create the perfect look (plus a few non-turkey essentials) in this weekly spotlight. Flatware and dinnerware are obviously essential for dining, and luckily you can refresh your collection with new pieces from Sturbridge Yankee Workshop. 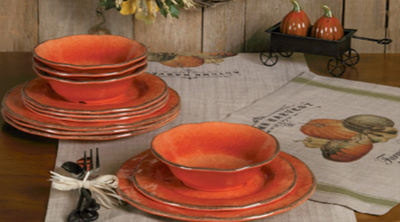 Our melamine collection features a few beautiful colors, but none is better for this time of year than the Harvest Orange. Our Flatware Set is handcrafted out of stainless steel that offers a unique look with appealing durability. And back for another year is the Pumpkin Wagon Salt & Pepper Shakers, a fun way to serve and store the two basic seasonings on your table. It’s no secret that we love wool table runners, and the Turkey & Gourd Felt Applique Table Runner is one of our new favorites because of its rustic country aesthetic and neutral color tones. Plus, the whimsical turkey and gourd imagery is quite unique. To complement this table runner and the season, our Large Turkey Leaf Candle Holder (two shown below) can be dressed up with small plants, and placing a candle inside creates warm mood lighting perfect for dinnertime. For this Decorating With Color post, we were inspired by October’s two birthstones: Opal and Tourmaline. Both stones are found in a variety of color combinations, but we’re focusing on the beautiful pink shades of each for the sake of this post. Pink in home decor – especially in farmhouse or rustic home decor – can be a little daunting, especially if that color conjures up images of magenta and hot pink shades. 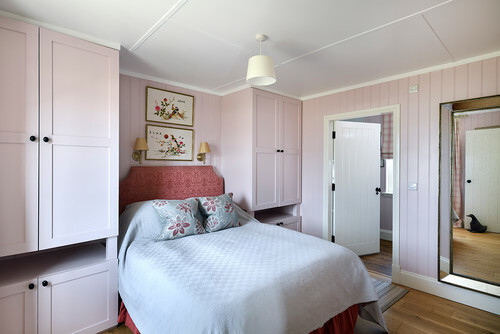 Pink may not be a color we commonly associate with primitive style and hues, but below we’re featuring a few rooms that show how it can work. Blush pink has certainly been having its moment. In the bedroom below, the blush pink is a few shades above white, so even though every wall is covered, it doesn’t feel overwhelming. Instead, it gives the room a soft, romantic look. The vertical shiplap combined with the cabinets offers aesthetically pleasing texture, which also gives the room more depth and interest than if the walls were completely flat (keep this in mind if you want to experiment with other colors, too). 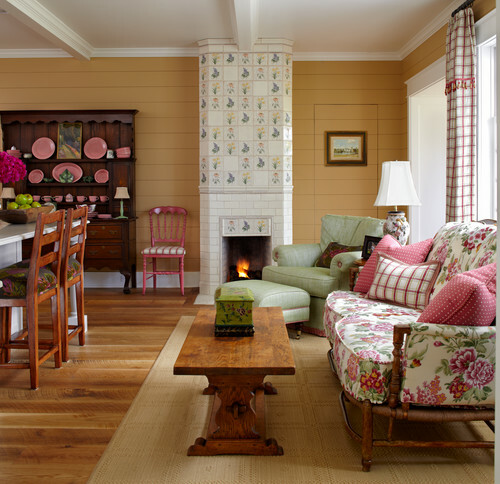 In a room with one or two neutral colors, a pink accent here and there can have big stylistic impact. The ombre valance below, for example, really pops on the window of this mudroom/entry, giving this high-traffic area a touch of whimsy and complementary excitement. Like with any color, accents of the similar hue scattered around a room will create a cohesive look. The decorative plates, furniture, curtains and pillows below all feature a smattering of pink, which makes formal more fun. 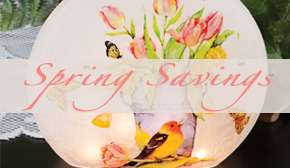 Have you used pink decor, furniture or other accents in your home? Tell us how you’ve incorporate this color in the comments below. Today we are featuring five must-have home accents that will amplify the season of giving thanks and add warmth to your home through color and timeless style. Take a look below. A perfectly whimsical sign inviting your friends, family and guest to dig in this season. 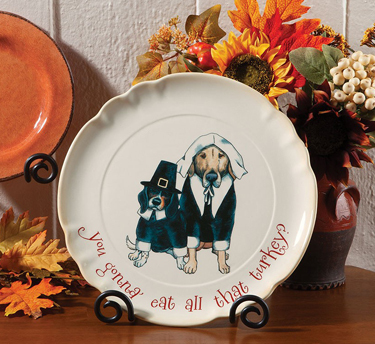 Serve your seasonal appetizers and snack son this serving plate, or simply display the charming imagery on the kitchen counter or in a centerpiece. 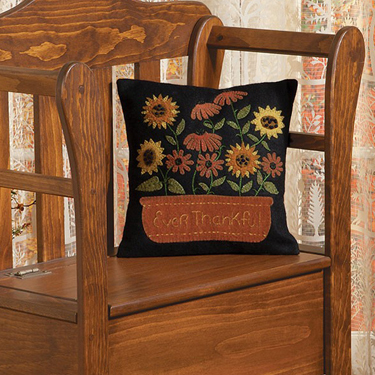 And if you love the Ever Thankful Felt Pillow, your home won’t be complete without the coordinating Table Runner. 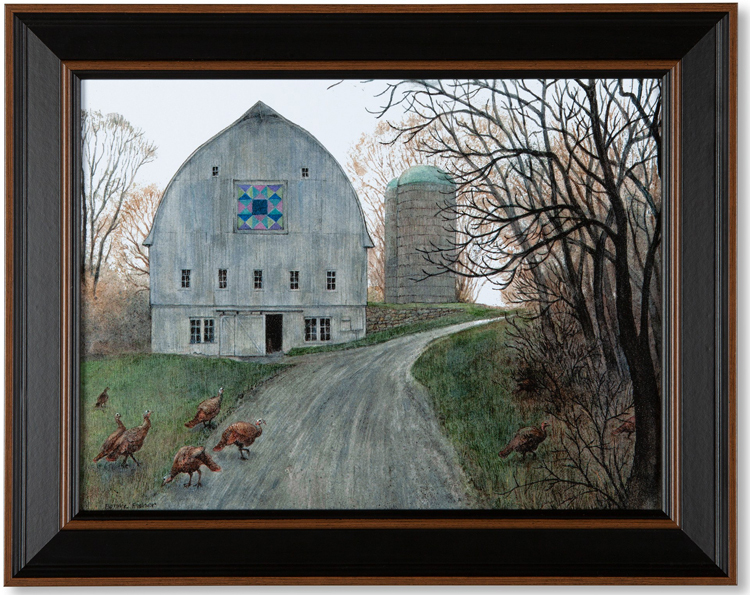 Most of the trees in this Bonnie Fisher print may be without leaves, but the flock of turkeys is enjoying the season all the same.